I've just returned to playing Heroes of the Storm since I left it during Alpha/Beta, when I noticed that they have an MVP feature now. This image was taking with a phone camera with very little time to focus (that screen persists for only 5 seconds or so), so please forgive the bad image quality. What determines who gets the MVP? I have the highest deaths in my team and my KDA is overall worse than the Nova on my team with a score of 9:16:3, so I don't feel like I personally contributed the most. According to this reddit thread that has been referenced at least 40 times on Google, it seems that it is not only based on the KDA of a player, but also heavily dependent on whether he has the Top Hero Damage, Top Siege Damage, and XP Contribution in his team, as well as the match as a whole. .2. Pick player with highest MVP Score. * If multiple players share highest score, pick the one with higher XP contribution (or random, if equal XP contribution). Deaths are not factored in the calculation. As Nova is a single-target assassin without a self-healing skill, she almost definitely did lower siege damage and healing overall as compared to Ragnaros. 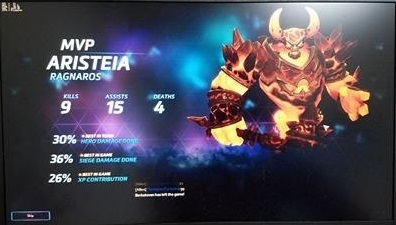 As shown in the image, Ragnaros has the Best Hero Damage in Team, Best Siege Damage in Game, and Best XP Contribution in Game, giving him a total of (1 + 2 + 2) points advantage over Nova, who only had a 1-point advantage by having 1 more assist. Thus, assuming that they had similar amount of Time Spent Dead given the 1 death difference, it is safe to conclude that Ragnaros is really the MVP of this game.